There are so many geeky activities I want to engage in with my kids. There are a half dozen TV shows ranging from Doctor Who to The Flash to Star Wars Rebels that I’d love to watch with them. There are still so many perler bead projects to start or complete. JSL has recently expressed interest in story writing so I’d love to have a "story writing time" with him where we sit down, write a story for a period of time, and then read each other our stories. I want to play some more Munchkin and maybe even Settlers of Catan with NHL. NHL and I also need to finish reading the last Harry Potter book so we can watch the movie together. (JSL is reading book 2 with B.) Then, there are the Minecraft worlds we can create and explore. There’s only one problem: Time. There never seems to be enough time to do all the things I want to do with them. Between my work, their school, and must-do chores/errands, our weeks seem to fly by with too few hours spent geeking out. Even when we have an hour or two of downtime, the boys seem more interested in playing on their own or watching TV shows they like instead of engaging in activities with me. I almost feel like we should schedule weekly Geek Nights where we all sit together and do one geeky activity together as a family. More and more I want to seize the day and enjoy every moment with them. It won’t be long before they are grown up and spending time geeking out with dad won’t be on the agenda at all. How do you find time to geek out with your kids? 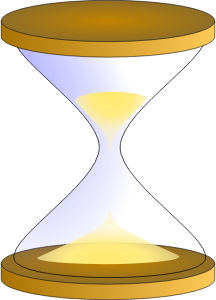 NOTE: The "Sandglass" image above is by Anonymous and is available via OpenClipArt.org.